Norsa Pharma Thyroset is an innovative dietary supplement comprehensively supporting the replenishment of the most common deficient micronutrients and vitamins, in particular in people suffering from thyroid diseases, for example, its hypofunction or Hashimoto's disease. It also supports thyroid hormone function and the functioning of the entire endocrine system. The product contains a set of three containers that provide three types of capsules for use in the morning, afternoon and evening. Each of the capsules differs with active ingredients, and their separateness and different dosage times are aimed at maximizing their absorption by the body. The manufacturer of the preparation also considered the synergistic and antagonistic effect of individual substances, therefore taking the supplement as recommended provides the most optimal benefits and prevents the mutual exclusion of some components. This product is distinguished by a minimal amount of additives and is produced with the participation of specialists in the field of gastroenterology and endocrinology in the best conditions, complying the GMP (Good Manufacturing Practice) standards. 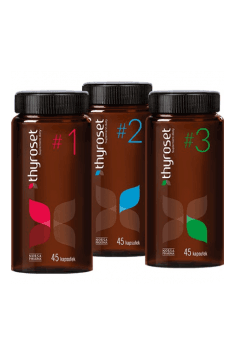 Thyroset 1 # is the first container containing capsules for use in the morning. They provide omega-3 acids and vitamin D3, K2 MK7 and E.
Omega-3 acids derived from fish oil are unsaturated fatty acids, including DHA or EPA. They are characterized by anti-inflammatory activity because they inhibit the production of mediators of the inflammatory process, e.g. prostaglandins, and thus may positively affect the patients with Hashimoto's disease, also known as chronic lymphocytic thyroiditis. They also have a beneficial effect on cognitive functions and pro-health effects in patients with other chronic inflammatory diseases. Vitamins K2 and D3 found in this capsule are involved in the regulation of calcium metabolism, and vitamin D additionally promotes the proper functioning of the immune system and the proper metabolism of phosphorus. The combination of these two vitamins in one capsule provides even better absorption and metabolism of vitamin D3 ensured by vitamin K2. In turn, vitamin E has antioxidant functions – it slows down the aging process, prevents the harmful effects of free radicals and protects cells against oxidative stress. Interestingly, the aforementioned vitamins are fat-soluble, hence they have been deliberately placed together with fish oil, which significantly increases their absorbability. Thyroset 2 # is the second container with capsules to be taken in the afternoon. They provide rich doses of vitamins C, E, B12 and selenium and iron. The synergistic combination of vitamin E and selenium makes the antioxidant potential of both components significantly increase. In addition, selenium itself improves the condition of hair and nails and also ensures the proper functioning of the thyroid gland. Not less important is ensuring the appropriate level of vitamin B12 and vitamin C. The first one is responsible for the health of the nervous system and mental health, and also prevents excessive fatigue and may protect against increased infections. It also helps in maintaining the proper course of energetic metabolic processes and supports the maintenance of the proper level of homocysteine (its elevated level creates a greater risk of e.g. cardiovascular disease). The second vitamin (vitamin C) is crucial in the course of collagen synthesis, therefore its appropriate level ensures healthy bones, skin, and joints. It also helps to maintain the immune system at the highest level and significantly increases the absorption of iron. Iron is an extremely important micronutrient for the production and maintenance of the correct structure of red blood cells and hemoglobin. Its deficiency can lead, among others, to anemia or constant fatigue. Thyroset 3 # is the third container of the set. It contains capsules intended for use in the evening. It provides as many as 5 active ingredients: zinc, magnesium, vitamin B6, folic acid, and biotin. Zinc is a mineral component responsible mainly for healthy skin, hair, and nails. It also contributes to the proper functioning of the immune and reproductive systems, positively affecting the fertility and quality of sperm in men. It may also positively influence cognitive functions and regulate the metabolism of nutrients. Zinc was deliberately placed in a separate capsule than selenium because they could inhibit one’s another activity. Magnesium, in turn, is one of the key ingredients that build bones and teeth. In addition, it plays an important role in maintaining the structure of organelles involved in protein biosynthesis, and also supports the work of the nervous system, which positively affects remembering, learning and concentrating. It may also reduce fatigue and help to maintain good mental health. The vitamins found in this capsule enable the proper course of metabolic reactions in cells, determine the proper course of homocysteine metabolism in the body and, importantly, help in the proper functioning of the endocrine system. In addition, the capsule also contains folates that contribute to the growth of fetal tissues in pregnant women, and vitamin B6 enhances the absorption of magnesium and facilitates its distribution to cells throughout the body. In conclusion, Norsa Pharma Thyroset is a dietary supplement in the form of a set containing three types of capsules to help to supplement the most common deficiencies of vitamins and minerals in people suffering from thyroid problems. Dividing the ingredients into three separate capsules guarantees their maximum effectiveness because it prevents the mutual exclusion of their effects and takes into account the synergies between them. This preparation will certainly prove to be extremely helpful for people who require special care for the health of the thyroid and endocrine system. Take one capsule of each type, respectively in the morning, in the afternoon and in the evening. This supplement provides high doses of vitamins and minerals, so it should not be used for more than 3 months, once a year. The product does not contain lactose or gluten, so it is friendly to people with intolerance to these ingredients. The use of this preparation is intended to help to prevent and supplement basic deficits, but it does not serve as the main therapeutic agent. In addition, in case of major deficiencies, it is recommended to perform appropriate tests and consult a physician. Norsa Pharma is a valued manufacturer of innovative dietary supplements designed and adapted especially for patients suffering from metabolic, autoimmune diseases and other rare ailments that require specific supplementation. The company is distinguished by the use of the highest quality raw materials and dynamic development, as well as the distribution and production of preparations based on the latest technological solutions and scientific reports. Owing to many years of experience in the industry and cooperation with a team of specialists in the medical, pharmaceutical and research fields, the manufacturer has a multitude of satisfied customers. The brand offers supplements that may very often support difficult pharmacotherapy, which may significantly speed up the recovery of patients. The medical devices offered by this manufacturer are characterized by the highest efficiency, bioavailability and a small amount of additional ingredients, whereas an affordable pricing policy makes access to modern dietary supplements becoming commonplace. Thyroset 1#: gelatin, humectant - glycerol, coloring - caramel. Thyroset 2#: gelatin, anti-caking agent - magnesium salts of fatty acids, coloring - iron oxides and hydroxides. Thyroset 3#: gelatin, anti-caking agent - magnesium salts of fatty acids, coloring - iron oxides and hydroxides. This product have cardioprotective properties and powerful free radical scavenging activity. Prevents cardiovascular system diseases; promotes normal inflammatory response of the organism. Vitamin B12 in the most available, methylated form; regulates energy processes on a cellular level. Supplement containing MSM. It protects the joints and supports regeneration, heals inflammations. Supplement containing vitamin of the B group. counteracts the effects of deficiency of these vitamins. Dietary supplement that helps with maintenance heathly cardiovascular system. DHA (docosahexaenoic acid) - acid of omega-3 family, unsaturated fatty acids with the last double bond in the chain located on the third carbon atom from the end. Synthesized in the human body to eicosapentaenoic acid, or retrieved from foods of marine origin (fish, particularly salmon). In the medicine it is indicated for the treatment of depression, Alzheimer's ADHD. There has been its positive impact on the insulin metabolism noted as well as on endocrine and cardiovascular systems. When used in appropriate doses, it has a beneficial effect on the composition and appearance of the body. In the the supplementation it is part of formulas containing fish oil, which fill in the gaps of unsaturated fatty acids Omega 3, recommended for people with different physical activity. Vitamin K2 belongs to fat-soluble vitamins It is an important activator of many enzymes and proteins It shows a positive action on calcium balance by activating MGP protein and osteocalcin. This results in the removal of calcium deposits from blood vessel walls and transport of ions of this element to the area where it fulfills its function – teeth and bones. It reduces therefore the calcification of blood vessels and thus the risk of cardiovascular diseases. Moreover, it is a constituent of coagulation factors and cosequently prevents haemorrhages. It shows a synergistic action in combination with vitamin D and magnesium. The iron part of the dye in the form of the heme (hemoglobin and myoglobin in meat), a non-haem (in plant), and enzymes responsible for transport and storage of oxygen in the body. It occurs in enzymes responsible for: the metabolism of fatty acids, prostaglandin biosynthesis, catabolism of tryptophan. The absorption of iron in plant is lower than in animal products. In plant foods, it is reduced by contained chemicals: phytates and oxalates, also calcium and high acidity (pH factor). Only 8% of the intake of iron is absorbed by the body and transported to the blood. For tts absorption is needed sufficient amount of: cobalt, manganese, copper and vitamin C. Iron itself is essential for the metabolism of B vitamins. Source of acquisition of iron are animal products (meat, organ meats, egg yolks) and plant products (whole grain bread, beans , cocoa, parsley, nuts, soy). Iron is also present in synthetic form as a component of vitamin-mineral and mineral and mono-preparation supplements, often enriched with vitamin C. Supplements containing iron compounds are recommended for athletes during intense training and those on a meatless diet (vegetarians and vegans). Iron deficiency causes anaemia. Using a large amount of strong coffee or tea hinders the absorption of iron. Symptoms of iron deficiency are: insomnia, diarrhea, impaired body temperature, loss of papillae on the tongue, reduced exercise capacity, and reduced intellectual and psychological efficiency. Excess iron reduces the absorption of other elements (e.g. zinc, copper), reduced immunity, causing tissue damage of some organs (kidney, liver, heart), increased risk of cancer. Dosage: 3-12 mg per day. Quatrefolic is the glucosamine salt of (6S)-5-methyltetrahydrofolate and also an active form of folic acid. It is an innovative nutrient (fourth generation folate) which is well soluble in water and thus absorbed effectively by the body. As an organic compound ranked among B vitamins, it is necessary for normal functioning at the cellular level. Adding folates to a diet is recommended especially to pregnant and lactating women. These compounds may contribute to healthy foetal development. According to studies, their intake may reduce the incidence of pregnancy complications. Some sources report that folate supplementation supports cardiovascular function (blood production) and contribute to healthy immune function. Quatrefolic may affect the metabolism of homocysteine whose levels increase in the body over time. Adding it to a diet may thus prevent the development of dementia and maintain healthy cognitive functions which is vital to adults, especially the elderly. Cortisol – enemy or friend? Capsaicin – a natural fat burner. What can we find capsaicin in?